While Langkawi offers stunning beaches and many recreational activities, a vacation in this island in my view would remain incomplete unless you have experienced a sailing cruise on the Andaman sea on a recreational yacht. From the deck of a yacht, you will admire the beauty of so many tiny islands on the sea, lovely secluded beaches where you can swim, the dense rain forests, the view of the mountains, spectacular sunset and so much more while you enjoy a drink and gourmet meals on the deck or on a desolate scenic beach. It's a whole new way of enjoying and appreciating many wonderful aspects of Langkawi that are otherwise not possible to experience from the shore. Imagine you are aboard a sailing cruise watching a stunning sunset as you enjoy a cocktail, which is followed by barbecue dinner. Or how about a day long cruise that takes you through the magical water areas of a geopark with dense mangroves on both sides, with lakes, lagoons, caves, islands & many flora & fauna to explore followed by a lunch on a secluded beach, or chartering a charming yacht for a romantic cruise or an overnight sailing? And guess what, most of these cruises have 'Jacuzzi' rope nets which they lower into the water and tow. Sitting on it you can actually enjoy the salty water waves on your body while you soak in the views with a drink in your hand. Won't you love that? Well you might be thinking that it might be an expensive proposition. While yacht cruises are not very cheap, but there are affordable options available for all. For example there are many operators who run their yachts on a sharing basis with a per person rate and offering different cruising themes at very reasonable rates. Depending on the type and duration of a cruise, such sharing rate can range from RM250 to RM450 per person. Such cruises usually include snacks and beverages on board, and some even offer cocktails with free flow bar. Short duration no-frill cruises (including day & sunset cruises) are also available at RM150 per person on a sharing basis. Small yachts take about 10-12 persons while the large ones can accommodate about 50 persons on board with enough private space. If you are looking for a private cruise for a special event like a marriage proposal, honeymoon or wedding, or you have a small private group of your own like friends & families etc, you can also charter a yacht of your choice and decide on the course, or leave it to the expertise of the operator to suggest an itinerary for the cruise. Most of the standard sailing cruises like sunset cruise and day cruises are available on chartered yachts as well. A private charter basic rate can start from RM2,500 per day (6-7 hours) for a smaller yacht to a King's ransom for a large luxury yacht. You can also go for a catamaran with double hull. Over the years, we have availed several yacht sailing cruises in Langkawi and tried out different operators. If you too are planing a sailing cruise, then consider one of the following options which are our personal favorites. The links below will take you to detail descriptions of the specific cruises, what you may expect out of them while on board or otherwise, and let you know who are the best operators for such cruises and their offerings with rates. This is by far the most popular yacht cruising trip in Langkawi. While the highlight is to view a stunning sunset from the deck of a yacht, the cruise also combines many other great opportunities like sailing around several islands on Andaman sea, enjoying the 'Jacuzzi' effect as you sit on a rope net which is towed in the water, free flow bar offering a range of alcoholic and non alcoholic beverages, gourmet barbecue dinner, excellent photo opportunities and more. There are operators who offer this cruise on a sharing basis on per person rates and also on private charters. You will take a leisure daylong sail in a lovely yacht for about 6 hours. The highlights include watching eagles feeding on the way, many different flora & fauna, enjoying the Jacuzzi effect on the sea while sitting on a rope net which is lowered into the water & towed, coming to a lovely secluded island beach and having buffet barbecue lunch, enjoying swimming, kayaking, exploring rainforest and more. There is free flow of alcoholic and non-alcoholic beverages all through the cruise. Know about the complete experience and the best cruise operators to choose from. 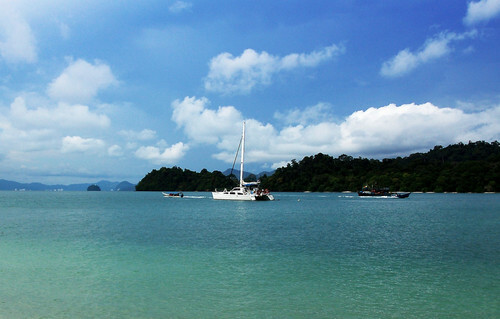 Know about the best sailing cruises in Langkawi that are ideal for romantic getaways. You can either go for chartering a boat with full exclusivity, or join few other couples on a sharing basis. The second option is obviously cheaper but also offers fair bit of privacy. These cruises are ideal if you are planning a honeymoon or a romantic vacation in the island. Would you like to dine on an open deck of a yacht at the middle of the ocean? Sleep under the starry sky as the yacht sways gently in the water? Or see a stunning sunrise from the deck of a yacht, swim at a beautiful island beach, or explore the forests and caves and get an all round flavor of Langkawi archipelago from the sea? Then you will need to take an overnight cruise. A cruise wedding in langkawi on a sailing yacht would probably be the most romantic and memorable event in your life. You can also plan just the wedding reception or after wedding party on the yacht. The cruise operators will arrange everything for you including food & wine, required documentation, Wedding Pastor, decoration, entertainment programs and everything else required in the event. They can customize the cruise as you wish. Know about those who are the best in business and what are their offerings. There are several sailing yacht operators in Langkawi who own their yachts and have been specializing in specific themed cruises over the years. Some have smaller yachts and catamarans with capacity of 12 - 15 persons, while few have large luxury yachts. You have the option of availing the cruises on a sharing basis or chartering a yacht for a private cruise. Visit Langkawi Top Sailing Cruise Operators to know about the top cruise operators in the island, their yachts, offerings, rates and contact information for inquiry & bookings.